Here are photos of that Reo Royale from 1934/35. Few years ago I exchanged messages with a man that knew about this. If I remember right this Reo still exsists. I try to find more information about it. Here is a thread to post info and pictures of cars in Europe. Juha, I moved your post to this new thread to discuss any cars you can dig up for us in Europe. Thanks for posting the pictures. I think 33 was the last year of the big Eight engine. Although this car looks to have a long hood Maybe one of our REO experts can comment? Thank you for your reply. I think this Royale is S-7 Series Reo with 6-cylinder engine. The photos are taken in 1936 when the owner family was visiting Lappeenranta in Eastern Finland. I try to find more information about this Reo and other possible Royales in Finland. I also follow some European classic car forums so maybe there is possibility to find out some other Royales in Europe, too. Some technical information about Reos in general and different models can be found through these pages. 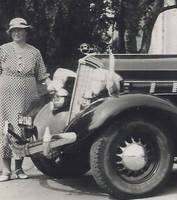 Here are three photos of 1931 Reo Royale which is in a carage in a town called Forssa. The Reo looks liitle odd although the car has been proven into veteran automobile register. The Royale has been imported to Finland several years ago. It may be so that the car only had chassis and the body has been put on the chassis here in Finland. It may well be so that the body is not from Reo or then it may be Mate Flying Cloud. At the moment I do not know anything about the engine. So it may well be Royale looking vehicle. I must try to find more info about this Reo and its history. Almost looks like a hearse that was converted to passenger use. Somewhere I remember reading that Reo got a big order for chassis to use at hearses. Maybe Victor or John remembers. Thank you for your reply. Timo Mäkinen here said that he thinks it is a hearses that has been here in Finland rebuilt as a passenger car. He olso thought that the chassis is the same lenght as Limousine. On this web-address was for sale in Denmark one Reo Royale. The Reo remained unsold and I think I have seen another ad of this fine automobile telling for asking price 92.500 dollars. The Reo has some Royal history. About that Reo Royale from 1934/35: I got in touch with the man whose family used to own the Royale. The family had bought the Reo as new. They do not have it any more. He has been trying to trace after the Reo and has found some records till 1950´s. At this point the engine had been changed. He believes the new engine was from Nash. I wonder if the are many survivours of 1934/1935 Royales. From Jan/Feb Issue 1982 issue of CCCA Michigan Region Torque Magazine. Does that Royale in Sweden have chrome spokes and rims ? or is the reflection . Who owns it now ? I'm new on the forum and do like this topic as we live in Belgium. We own a 1930 8-35 Murray Body Royale since 1990. That’s how, being often in NY, he shipped back his first Reo Royale on one of the ships. He owned several and drove these REO’s for years and my father (born in ’39 and passed away in July this year) remembers well his youth in his grandfather’s REO. That’s why he always wanted to have a Reo Royale. We found this one in early 90’s. We Imported it from the US with a 1964 Californian license plate. We believe it was kept in a barn since 1964 because not much was left of it. My father then had it fully and professionally restored here in Belgium. It is in a pristine condition. We only drove it for my wedding ceremony. My father didn't like to drive it to keep it in that condition. My brother and I will now take that REO of her blocks and restart it. We also had a Red Reo Royale Victoria Coupé we bought in Sweden which we later sold and shipped to the US. If you try to save the Swedish Royale photo into your computor you find that the name of the file tells you that the Royale is now in Norway, The name of the file is ReoRoyaleinNorway. Nice to hear also about that Royale in Belgium. Could it be so that the Royale is from 1931 since I think that was the first year of production of Royales? Is you Reo a seven passenger Limousine? 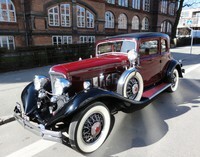 If so that would be the same Model of Reo that was used the prime minister of Finland in early 1930´s. Hi. I have an old postcard of the Swedish Royal. Its probably from the late sixties. We changed numberplate 1972-73 and it has the older system. I wonder if it isn in Norway or still in Sweden. I have been told that there are one Royal still in Sweden.